Candy is our senior pitbull. She was a rescue and currently serves as an ambassador for the breed. She has been the poster pooch for a few events at our local SPCA. She enjoys lazy days, walks, and snuggling on the sofa with her humans. She was super excited to pose in her costume! Comments for Candy, The Lady Bug! Everyone know education for the advancement of woman and our social development. In education, writing play an important role for getting high grade in assignment work. So don’t worry about your writing our qualified writers help you with our dissertation service and complete your writing task. I think Candy is adorable. Don't know why people only gave her a 3. She got a 5 from me! I voted just like you said! Got your email and you've got my vote! Love her story. She's got my vote. I'd give her a 10! 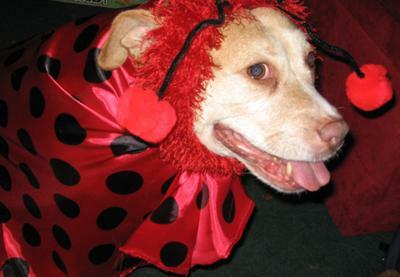 Candy is the cutest lady bug I've ever seen! she gets my vote. Great job! Wish it was a more full shot of her. She is absolutely adorable! Thank you for taking her out to show people what awesome companions pitties are!